After the good response (800 views and counting) to Part 1 of Potpourri, we’re here with the second edition. Read on for interesting articles on several aspects of Bengali Food – food in literature and its critique, memoirs, influences, popular culture, restaurants and the bong connection. Sreyashi Dastidar argues that the time around Durga Puja is the ‘sweet season of Bengal’. What else will explain a 20-something, with gelled and spiked hair, shouting “কাকু আমায় আরও দুটো সন্দেশ [Uncle, 2 more Sandesh please] at a community lunch in a housing complex. Or, crowd noisily demanding “তিরিশটা ছানার গজা” [30 … please] She also outlines the demands of ‘new kids’ and ‘GeNext’ that has forced the sweets entrepreneurs to innovate. Sample these – a mix of Bengali mishti and north Indian mithai, Kiwifruit Chhanar Payesh, Carrot Rasogolla, Sitaphal Kanchagolla and the likes. A tasty read indeed. 4 years back, Shrabonti Bagchi wrote about how several Bengali Restaurants have opened up in cities across India. 6 Ballygunj Place, Oh Calcutta and K C Das in Bangalore, Chowringhee in New Delhi, Howrah in Mumbai and 4 more in Kolkata. Well, since then, more bong eateries have mushroomed outside Bengal. I can count at least 8 in Bangalore, 10 in Mumbai and 4 in New Delhi. This is both due to immigrant bongs and increased awareness of Bengali platter among other communities. I would say probably a third of the clientele of these eateries doesn’t speak Bengali but want to check what Bengalis eat other than Maach (মাছ – Fish) and Rosogolla (রসগোল্লা – Rasgulla). As Shrabonti says, let’s raise our aam porar shorbots (আম পোড়ার শর্বত) to that! Radheshyam Sharma explains the pains of a vegetarian while eating out in Kolkata. Now imagine hating anything that ‘smells fishy’ (literally) but any restaurant you go to serves fish. Or, has written ‘pure veg’ on its signboard, but essentially doesn’t use separate utensils for meat and fish dishes. Nasty indeed. 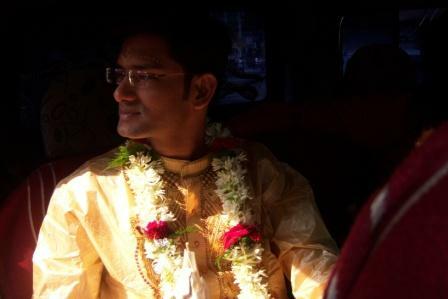 He gets ‘especially bothered’ if he is invited to Bengali Weddings even though he likes Mishti Doi and other sweets. And all because he can’t stand smell the fish. Smelly Cat must be smiling. 🙂 Another version of the video. Well, if you know any good Pure Vegetarian restaurant in Kolkata please let him know. I’m sure you would be thanked. Venu Madhav Govindu presents India’s enduring love affair with food in this Outlook article. He argues that like every other cuisine, Bengali food is also affected by both mindless imitation and the simple expedient of convenience. Well, do you agree with his version? Chitrita Banerji (চিত্রিতা ব্যানার্জী – read her interview with Timeout) is a celebrated author on Bengali food. Three of her popular works are Life and Food in Bengal (released in 1990), Bengali Cooking: Seasons and Festivals (released in 1997) and Hour of the Goddess: Memories of Women, Food, and Ritual in Bengal (released in 2007). In the first book, the author ‘invites the reader to enter, observe, feel and absorb Bengal-the Indian state of West Bengal and the sovereign country of Bangladesh’ [source]. The third book takes you on an idiosyncratic journey through the intricate backlanes of Bengali food, argues Amitabha Mukherjee in an elaborate critique of the book. Here’re two more reviews – Anuradha Roy’s in Outlook and Arundhati Ray’s in Hindu. Have you read any of Chitrita Banerji’s books?